At a campaign event Saturday a group of African-American leaders endorsed Mayor Rahm Emanuel for re-election. 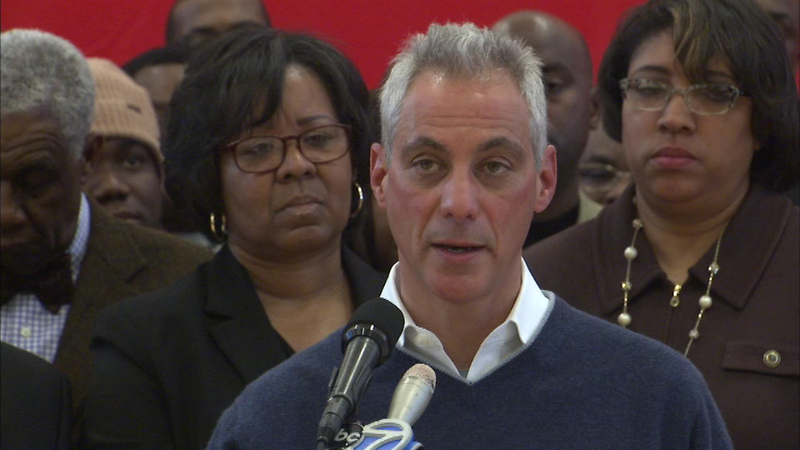 CHICAGO (WLS) -- A group of African American leaders endorsed Mayor Rahm Emanuel for re-election at a campaign event Saturday. Among them were Illinois Secretary of State Jesse White, Ald. Carrie Austin and Dr. Byron Brazier from Apostolic Church of God. Three men challenging Mayor Emanuel joined a rally organized by the group "Citizens to Abolish Red Light Cameras." Ald. Bob Fioretti, Cook County Commissioner Jesus "Chuy" Garcia and William "Dock" Walls all say the cameras do not increase safety. Instead, they say the cameras' purpose is to generate revenue. Candidate for mayor Willie Wilson spoke with voters Saturday at the Chicago Public Library Manning Branch on South Hoyne. His campaign says he wanted to meet directly with voters to find out what they expect from the city's mayor. He told them his top priorities include economic development, education and public safety.